Recent Items in Start Menu of Windows 7 and Windows Vista (not to be confused with recently opened programs list) provides an easy access shortcut to most recently used files, documents, spreadsheets, worksheets, presentations, photos, pictures, images, PDFs, ZIPs and etc. This files accessed and opened history information stores trace of your file activity on the system for up to last 10 files that you open or access. To protect privacy or don’t let others know what files you have opened especially on public shared computer, we can erase all trace of the files that have been opened, used, edited, created or accessed listed inside the Recent Items list. To delete and clear the Recent Items listing, simply open up Start Menu, and right click on Recent Items, then select Clear Recent Items List“. Voila, nobody will know your file access history for that session anymore. Replace UserName with the actual user ID used to login to Windows. You shall see several shortcuts in the directory. 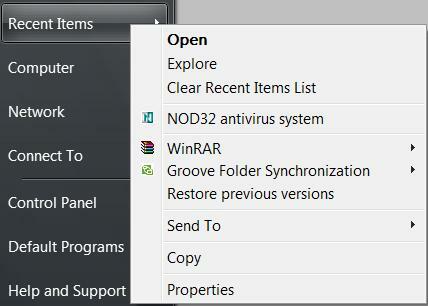 Choose the recent items’ shortcuts that you want to hide from Start Menu, and delete them.